Starting a new thread to document the installation of a fuel cooler on my '94 K75RT. Picked up this cooler on eBay. Looks pretty nice and has as many fins internally as you see on the outside. Has a pretty good volume that should give me about 40 seconds of residence time. Extruded aluminum body looks pretty snazzy and doesn't require any protection from stones and other debris. 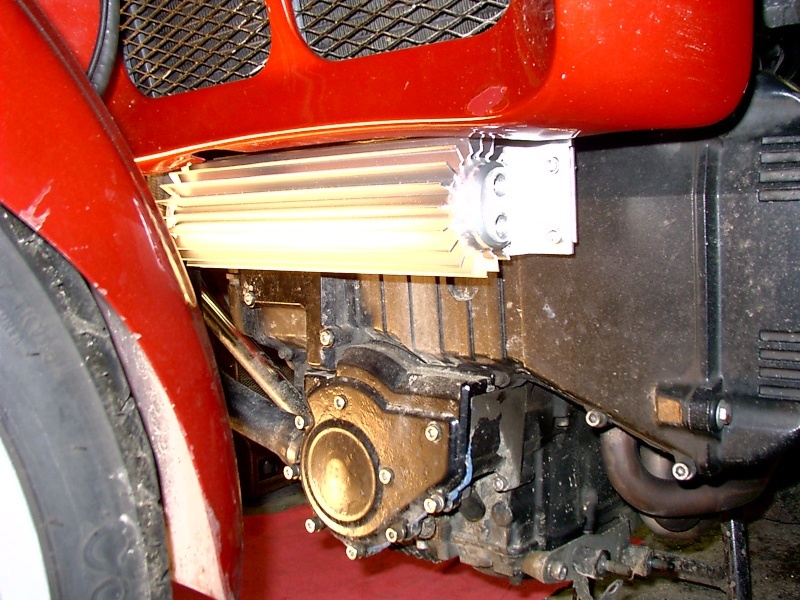 I am mounting the cooler horizontally below the radiator and in front of the cam chain cover. Hose connections will be on the left hand side. 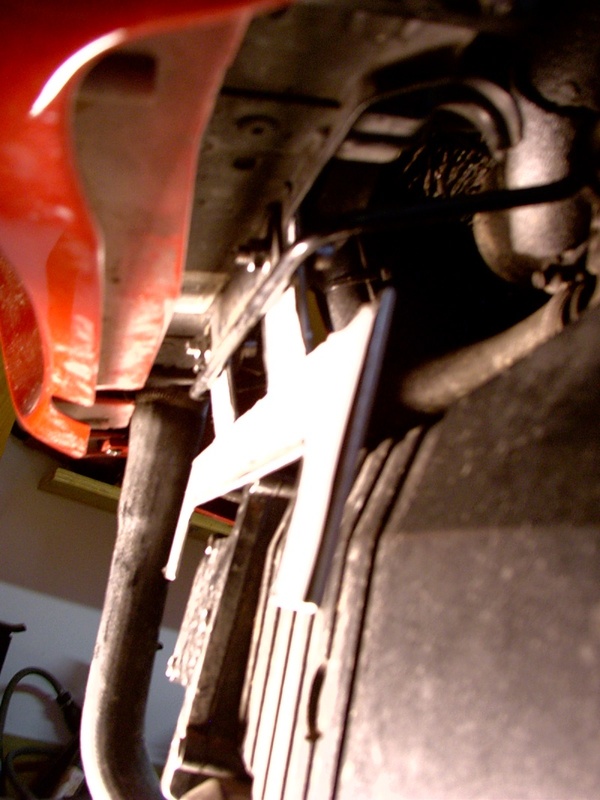 The mounting bracket will be bolted to the lower radiator bracket. I removed the existing flat head screws and the body nuts they screwed into. Replaced them with 25mm long 6mm bolts with fender washers, lock washers and nuts. The bracket goes in under the mounting tabs for the fan. Bolts go from the inside with the nuts outside. Bracket is approximately 3mm thick stainless steel. Drawing with dimensions I used to follow. it works so well that on a cold morning I don't get the nice warm tank to keep the knees warm. can I add something to the thread ? ..don't forget to protect the feed and outlet lines from debris exposure ...the refrigerant insulation tubing does a fairly good job at this ...it will not protect during a crash event at all ...be aware !! Good observations, Charlie. I have just taken delivery of an Extenda Fenda to do exactly what you suggested. As far as fuel line exposure, With any luck they will be mostly behind the radiator fairing. 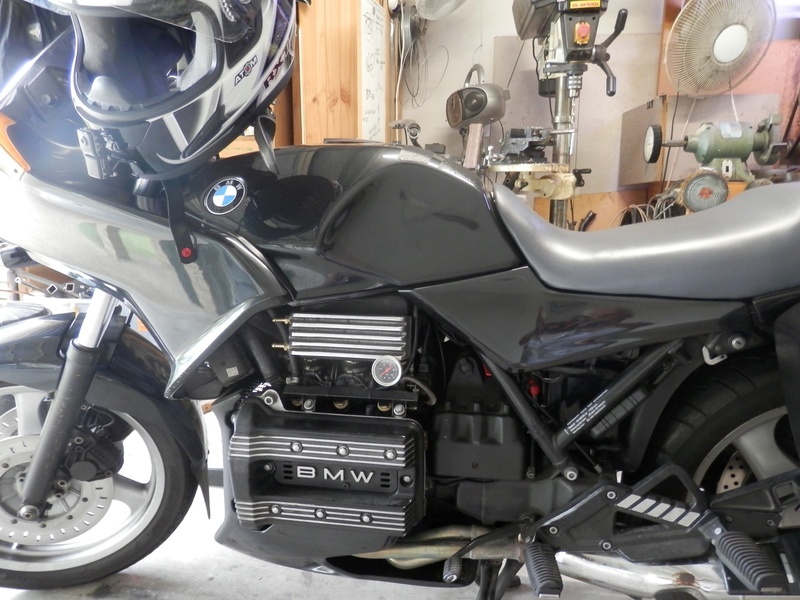 I have positioned the cooler as far over to the right of the bike as possible limited only by the cooling hose that is on that side in front of the crankcase cover. I don't think stones will be much of an issue on the fuel lines as witnessed by the aforementioned coolant hose. 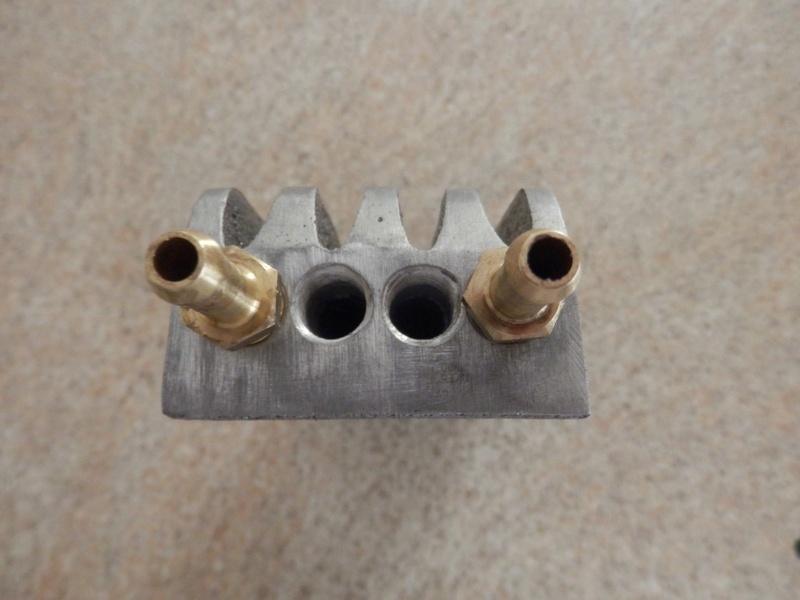 I am also planning on shortening the hose barbs and have chased the 1/4" NPT threads in the cooler to get the ends of the barbs in toward the centerline of the bike as much as possible. I've gotten about 3/4 to 1". Will be heading out to the garage in a little while when things warm up a bit more. Need to run into town this morning to get another drill bit as the darn stainless I am using is a welding grade and merciless to cutting tools. Rick, I looked at your installation originally, but couldn't figure out a way to mount the cooler without getting rid of the radiator fairing. Thought about going below the radiator fairing, but couldn't think of a way to neatly protect the fins with the limited fabrication capabilities at hand. As you can see, the cooler I have settled on is a fairly robust if somewhat bulky unit that I expect will keep things close to ambient on the hottest days at the slowest speeds. The only thing I give away to Charlie's design is that I do not have the benefit of the fan drawing air over my cooler when at a standstill in traffic. Still, I think the open design of the cooler, and it's being unenclosed will allow a fair bit of convection air flow round it. That with the extended residence time should keep the exit temperature reasonable even at a standstill. Cooler is mounted. Revised bracket above will get about 1/4" more clearance to the bottom of the radiator fairing. Need to cut down the hose barbs and get a chunk of fuel line to finish things up. At least I know the cooler fits and doesn't stick out too much. One ride this year and already the bike is filthy! Still too cold to wash her. Going to put a little insulation on the exposed hose. Need to touch up the Left side lower before I put it back on. I think it looks pretty good. Radiator grille hides it pretty well. Hoses look to be out of the way. I like the looks of that cooler. It's prettier than run of the mill coolers with plate metal fins. How will you be comparing the before-install and after-install temperatures of the fuel? Would it be an idea to include a bypass valve in case the hoses or cooler springs a leak? Thanks Rob, before/after comparison will be this summer, probably as soon as early May when I can run a full tank of gas down to about a third of a tank and not have my thighs barbequed. Don't know about a bypass valve; sounds like extra plumbing, fittings and chances for leaks. There is not that much additional hose in the circuit. I only added one hose about 15" long running from the cooler back up to the tank. 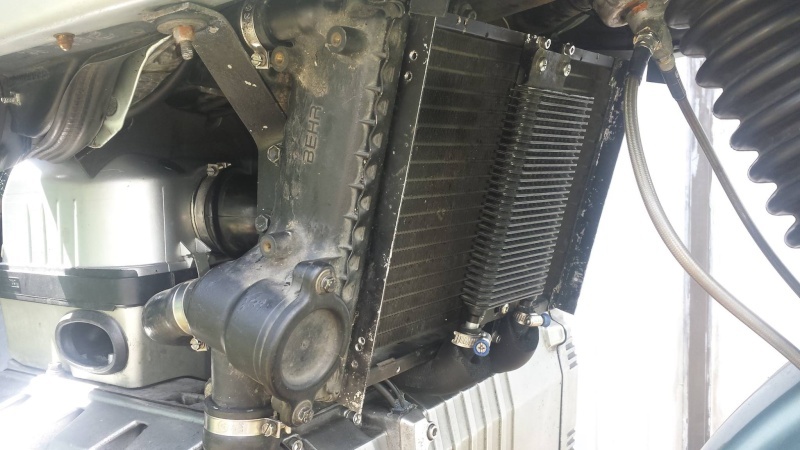 The cooler itself is probably the most bulletproof part of the fuel system. 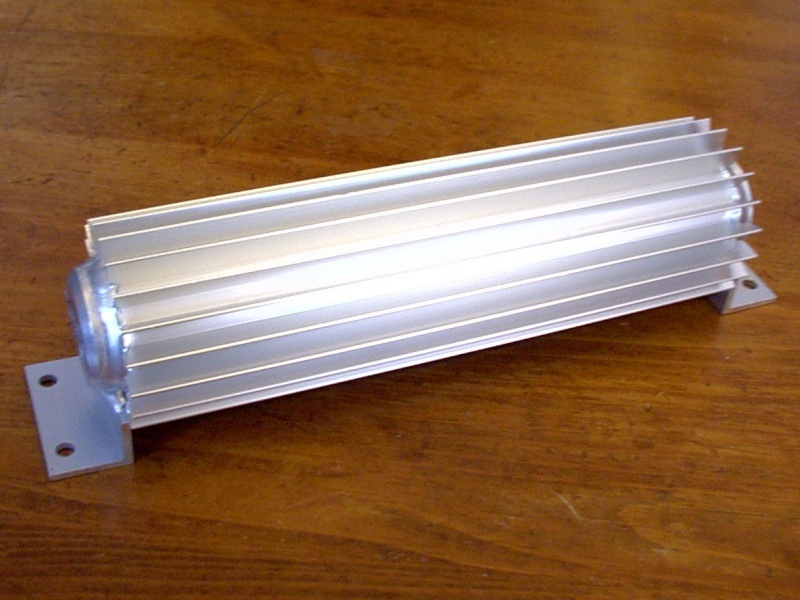 The body is an aluminum extrusion, and the 3/8" thick end caps are nicely welded on. I may add quick disconnects in the lines, just to make removing the cooler or tank easier. Great work. Thanks for the pics and the details. Use it to connect the hoses instead of the cooler . I don't think that this cooler is going to leak. It is a fairly heavy wall extrusion. Much stronger than the conventional coolers that are built like radiators. Being afraid of a fuel leak was the main reason for selecting this particular cooler, I wouldn't want to risk the other type of cooler. Not only are the cooler walls heavy, but the welded end caps are about 10mm thick. If there are going to be any leaks, they would be in the hoses, and they would be there even if the cooler wasn't. 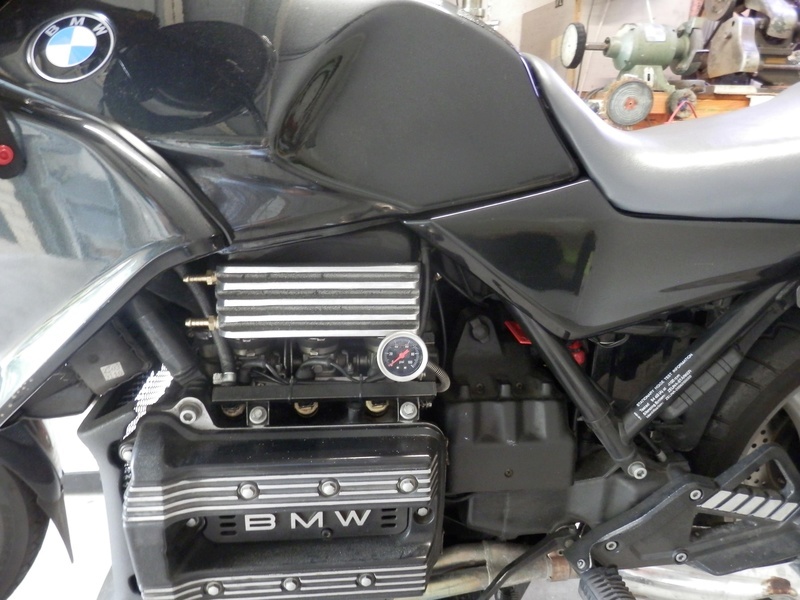 The hoses connecting the cooler are really tucked away well behind the radiator and the left side lower fairings. The only exposure is about 4-5cm right at the cooler connections. 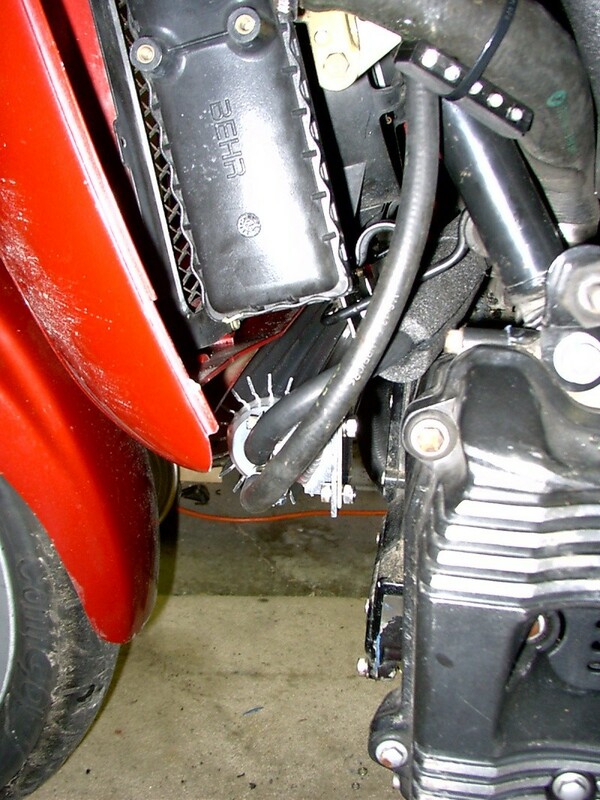 There is actually less exposure than the standard fuel lines on a naked bike. I could get better photos of the installation, but the bike is wedged into a small corner of my garage right now in a position that makes getting a good picture impossible. Bottom line, except for adding about 35cm of hose and two clamps, there isn't anything that would make the fuel system less reliable. And remember, this is in the return line where the pressure is only high enough to push the fuel back up to the tank at a head of about 50cm at the very most. And what's really beautiful about this mod is... That if it doesn't work out for any reason you can put the bike back to stock in a few minutes. I agree with the above comments, I was afraid of pushing GASOLINE through a thin-walled conventional radiator, for fear that the smallest rock chip would make a leak. I've got this cooler in hand right now and it is very beefy, made of strong extruded aluminum. I would have expected it to cost $100 at least. At $25 it's a real bargain. Can't wait to get it hooked up. Thanks for all the info Point-seven-five. I am still waiting for mine to arrive. I don't have any idea when I will be able to test it, but here in Eastern Canada, we are working really hard to get rid off the winter and start our biking season. I know it's been a rough winter because my snowblower has more kms on it than my motorcycles. As I have multiple options to install the unit, I am wondering what would be the best position. Should it be mounted facing the road(#1) or parallel to the frame of the bike(#2)? What do you think is the most efficient? I took out my thermal lining last weekend. 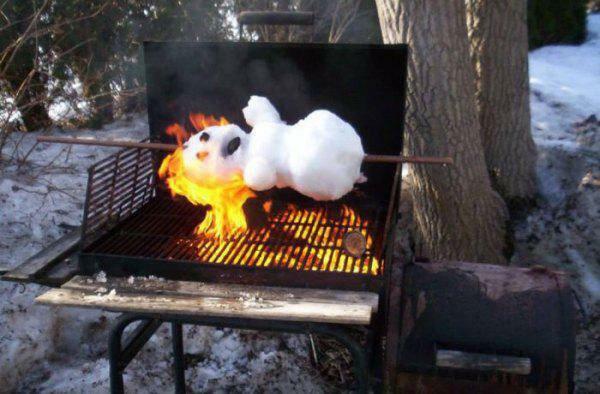 I must try some bbq snowman too. Last one I tried was a peaty taste and kind of interfered with my head. Must have been the Scottish snow. Fuel cooler looks excellent and have seen those type. They are quite robust and should do well. 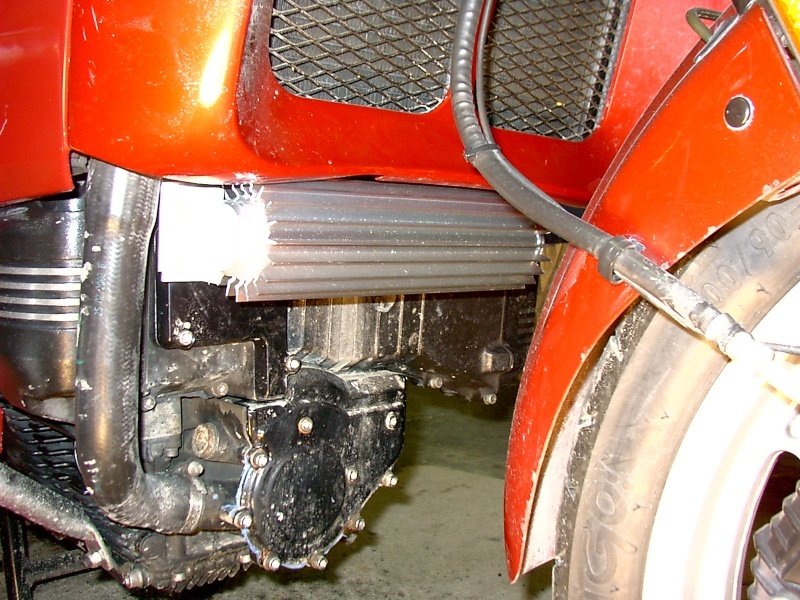 The extended front fender is essential as the efficiency of the cooler is reduced if its caked up. I have noticed when the gas tank is full the fuel stays cool but when the level gets low it gets very warm. If I had the flexibility in positioning, I'd be using position 2. When mine arrives, I'll be using version 1 as Point-seven-five has done, but I don't think the difference either way will be massive. Option #2 is the most efficient, but difficult to implement on my RT. Bert's bike with the chair should be able to go this route without much trouble. Option #1 does have the benefit of more turbulence around the fins although the back side won't see as much airflow. 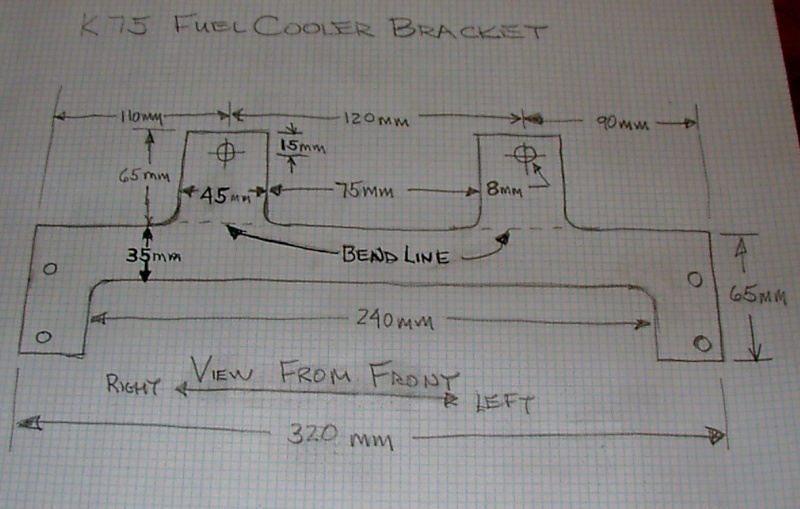 Because it is a two pass cooler with the passages horizontal in my installation, it is best to have the entering fuel at the backside where the airflow is less and the cooler body is not as cool as the front. 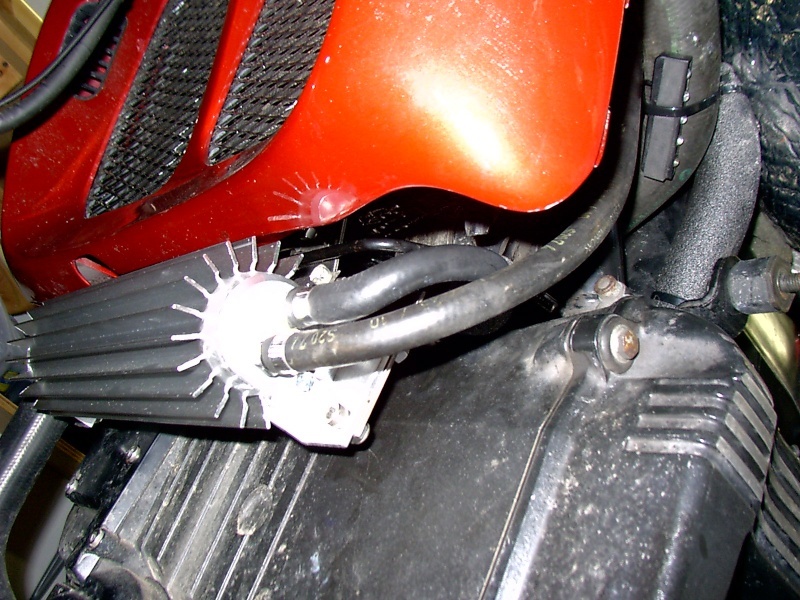 This is to maximize the temperature difference between the fuel and the cooler body and thus the heat transfer. One of the features of this cooler that I liked was that it has an internal volume greater than 1/2 liter which should give the fuel something like 40 seconds of residence time in the cooler as it passes through. 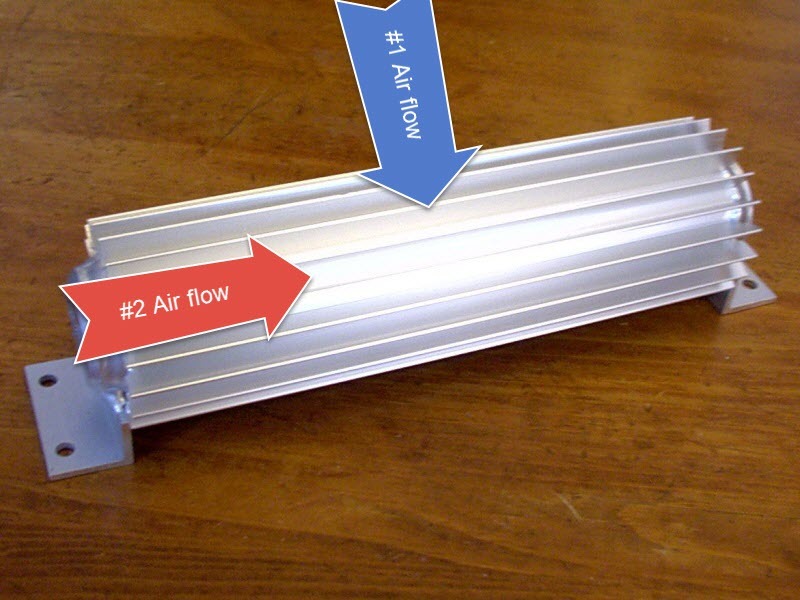 That will allow lots of time for heat transfer as opposed to the radiator type coolers that hold a lot less. My cooler is installed, and as soon as the weather breaks I hope to get out for a trial run. Later in April I am hoping to make a trip to Colorado, about 3500 miles round trip. I will be reporting on how it works after the trip. Olaf, low tanks are probably getting warm because there is less fuel to absorb the heat. With 1/2 the mass, the same heat input will raise the temperature twice as much. A low fuel level also has less contact with the walls of the tank and the walls it is contacting are at the bottom where the insulation is installed. The fairings don't help with cooling the tank either. As I am a cheap guy, I always look for bargains. Here is a very efficient type of cooler not costing an arm and a leg . In fact it could act as a gas tank. Holy Crap! Where do you find those pictures? Update: Just finished the second day of a three day run to Colorado. 540 miles yesterday, and 660 today. Ambient temperatures in the 50-60 F range. No perceptible rise in tank temperature above ambient both days. No operating issues or leaks to report with the cooler. Just coming back to report on two seasons and nearly 20,000 miles on the cooler including a week of riding in New Mexico, Utah and Arizona in temperatures up to 118F/45C. The cooler has been totally trouble free, in fact, I have just about forgotten it's even there. The best part is that "hot tank syndrome" has been eliminated, even in last summer's desert heat. I still get some heat coming up from under the fairing, but it isn't as bad as what I was getting from the hot fuel in the tank. The bike is way more pleasant to ride now. 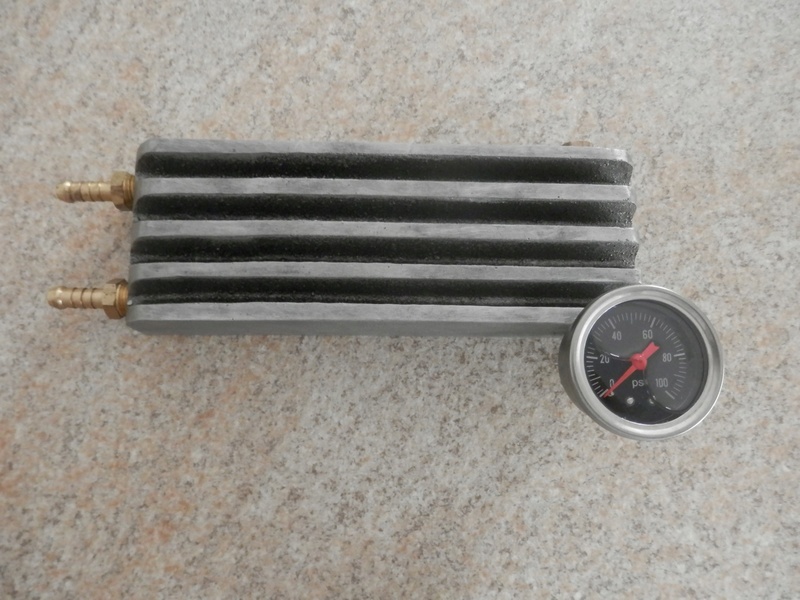 I finished up deciding to use a standard transmission oil cooler type, mounted to the front of the radiator screen. Cheated by using cable ties, but it hasn't moved. Its been very successful, going from not being able to grip the tank with my knees on anything other than a cool day, to no problem even on the hottest days. My recent run to Guyra and smithy's place on BOB the Blue Old Bike showed a slight tendency to be warm, even though the weather on the whole was pretty pleasant. 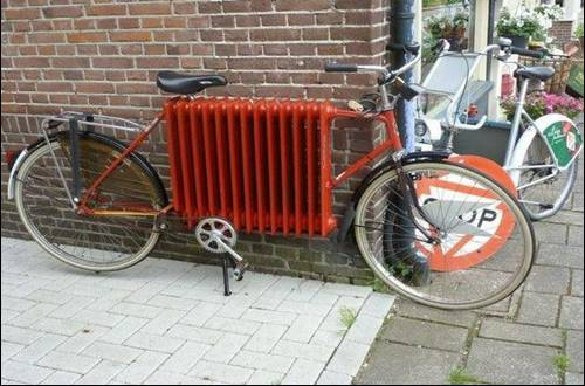 Nothing like the red bike, but to be sure, I've sourced a fairly similar cooler to be installed on it, one of these days. Oh well, at least they're black cable ties. @Dai wrote: Oh well, at least they're black cable ties. I couldn't have borne the shame of white ones! What is that cooler off Bill? For 9 months of the year here the warm fuel is quite welcome, especially just now while we are zero temperatures. But in France last year when we had 35c hot fuel was bad. So this idea is very welcome and seems quite easy to fit too. @K75cster wrote: What is that cooler off Bill? It's a generic found by doing a search for "transmission oil cooler" on eBay. No idea what it is designed to fit, but I just checked published dimensions for the space where I fitted it. The one I have for BOB the Blue Old Bike is slightly different in dimensions, and is even pre-painted blue, though lighter than the bike's blue. I did have to do some searching for the fittings for the fuel hose to cooler interfaces. PS. 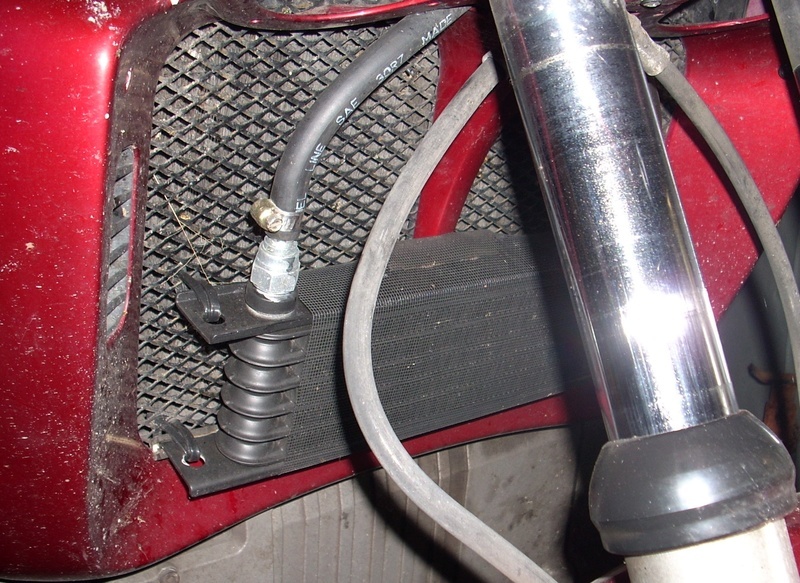 Make sure it's installed on the return line so it's not under fuel pump pressure. I chased around for a while for a commercial fuel cooler the would fit on my K75s. I could not find anything of the right size that would not look out of place. So I ended up making my own. Took a bit of stuffing around but it's nearly finished and I'm happy with the look of it. It going to be located over the fuel rail under the tank. I am still chasing 1/4" Allen plugs locally I will try a couple more places on Monday, but if I'm unsuccessful I'll order of Aliexpress. I still haven't decided whether to paint and polish just the fins. And while I believe that sandcast aluminium disperses heat better than machined aluminium I've been unable to find anything that supports my theory. You guys are so enlightening. I didn't realize it was the heat from the fuel tank. I just thought it was coming off the motor. Looks like another little project coming up . Motospecs at 280 Cullen Ave East http://www.motospecs.com.au/ Have small oil coolers about 100mm x 150mm and 20mm thick which are ideal. I have one and also Charlie. They are just right. I bought all the parts to reco the ZF auto in my car, they were great to deal with and while there I spotted a large cooler that was the same construction as the fuel cooler and asked about them and he showed me one that was identical. Thanks Rick but a bit late I'm almost finished. Just have to get the Allen plugs maybe give it a sandblast on the sides where I had to remove some of the residual slag. Then decide whether to paint and polish, then mount it. I chased 8" coolers all over the net but could not find anything I considered suitable. With the one I have built, if it doesn't run cool enough I also have the option of adding fins to the rear. I have now gained access to a turret mill. I can't seem to access the link you have posted. Thanks fellas I just had a look at it, unfortunately not really applicable to what I wanted. Due to the fact that I have a K75s the only place with enough room was in front of the radiator fairing or in front of the belly pan. I will be mounting mine above the fuel rail so that the fins are in the right orientation. I will post a picture when I get it mounted. I think I measured 10-13mm behind both the radiator fairing and the belly pan. Not enough room to get it behind with anything I could find. Hence the building it from scratch, it caused a few headaches but I got there in the end. And I am pretty happy with the result although time will tell if it is effective. Martin, nice job so far. If there is ever a MkII version, may I suggest that you go to thinner fins closer together. A fin to spacing ratio of 1:2 should work. The idea is to get maximum surface area. Also, try to get the passages as close to the fins as possible to minimize the distance the heat has to travel. The other two variables to heat transfer are turbulance, which results from smaller passage cross section and residence time which is a function of internal volume. Larger volume, more residence time, more cooling. Thanks Gryph the fins are a bit thick. The Mk1 version pattern had more fins and thinner but due to the requirements of casting I had to go thicker and fewer. Even with the thicker and fewer fins it took three goes to get the pattern to hold together. I was going to thin down the back after casting, but I have left it thick with the view to adding more milled fins. I maximized the volume as much as I dared. Due to the fact the galleries were drilled with drill bits with a total length of 300mm I had to be extremely careful not have the bits wander into the neighboring gallery. Now with access to more equipment the Mk 2 version if needed will probably be milled then sandblasted. The pattern used for the casting is the Mk 6 version, I had a few problems but I learnt during the process. Hoping to get it finished today if I can source the Allen plugs. I still unsure about painting it, and if I do I wont paint the back. Due to the fact that the casting had to be sanded to remove dags I was only able to take measurements of the shrinkage at the base, front and rear. The pattern base width was 70.04 mm front and rear, the casting measured 69.57mm front and 69.84mm rear. @MartinW wrote: And while I believe that sandcast aluminium disperses heat better than machined aluminium I've been unable to find anything that supports my theory. My attempt at support for the theory is that sandcast has a greater surface area than machined, and heat transfer is increased by greater surface area. This is exactly the reason that air cooled engines have fins rather than just cylinders, and radiators of all types have fins as well as tubes. Yours is certainly prettier than mine for all its extra work to produce. I expect it will be effective, and am looking forward to your report of its success. Spent 2.5 hours chasing bits, the third place I tried had six only of the Allen plugs. The rest of the time I zig zagged back in the direction of home chasing Teflon paste I eventually got it at the local Super Cheap the closest car place to home. I had tried six places before I struck gold. I proceeded to fit it out and I am reasonably happy with it. But when I went to make the brackets and found I had no aluminium flat bar. I had had enough of chasing around in the morning and also had to take the Honorable Minister to the Doctors ( Nothing serious). So I will have to chase some flat bar tomorrow. However I had some double side tape so I stuck it on roughly in the position it will occupy give or take an inch. It does sort of stand out a bit more than I anticipated so a paint job including the end of the fins might be called for. why the pressure gauge ? isn't the outlet of the pressure regulator a very low value ? Charlie I have a real good reason for the gauge, I had one floating around and I needed to fill a hole. And I'm one Allen plug short. I might not stick with the gauge but once it is hooked up I'm interested to see the reading. I've taken readings at the rail but never on the return. And maybe it will show something if the FPR is out of wack. @MartinW wrote: Charlie I have a real good reason for the gauge, I had one floating around and I needed to fill a hole. A clinometer in there would give observers something to think about. Laitch great suggestion as always, I have another hole plugged on the upper side. Any suggestions?? There you go problem solved, not that there really was a problem. I picked the last 1/4" Bspt Allen plug in the area. Picked up some stainless plate for the brackets,I now need to order a clinometer, and a boost gauge. Feeling a bit slack today so I might just paint it and do the brackets on Friday.